During the 2015 election campaign, Prime Minister Justin Trudeau promised to “bring Canada back” into the world. There is little doubt that he and his foreign minister, Chrystia Freeland, are highly visible personalities on the world stage. If the number of selfies in which Trudeau has already appeared is any indication, he is already an international rock star. Rare for any Canadian, let alone a politician, Trudeau’s iconic status means that his every move is watched and scrutinized by the world’s paparazzi, especially when he takes to the stage to do an Indian Banghra dance. With respect to foreign policy, Canada may be “back,” so to speak (though it never really left), but Trudeau’s government is playing defence. Its centre, mid-field position isn’t one of its own choosing, however. U.S. President Donald Trump’s threat to tear up the North American Free Trade Agreement has consumed the government’s energies and pretty much every waking hour of Freeland’s days. As a consequence, there has been precious little time for the Trudeau government to make a bigger mark on the world stage. The G7 summit, which Trudeau hosted in June in Charlevoix, Que., underscored the old adage, “the best laid plans of mice and men often go awry.” In this case, the cat that ate the mice was Trump, who refused to sign the summit’s final communiqué and took great umbrage over Trudeau’s post-summit press briefing at which he remarked that Canada was not going to be “pushed around” and would retaliate against U.S. tariffs on Canadian steel and aluminum. The Trudeau government still has time to save NAFTA and to do other things on the world stage where there is a scarcity of global leadership. The accomplishments of his predecessors were most marked, to paraphrase Thomas Carlyle, by a desire to achieve not much of anything. It is therefore not surprising that Canadians still look back with more than a little nostalgia to the era of Lester B. Pearson, though Pearson’s major international accomplishments, including his work to defuse the 1956 Suez Crisis for which he was awarded the Nobel Peace Prize, were carried out while he was foreign minister in prime minister Louis St-Laurent’s government and not as prime minister. Alongside Pearson, however, there is another Canadian prime minister who merits greater attention than he has been given for his foreign policy legacy. His name is Brian Mulroney. As one of NAFTA’s chief architects, Mulroney is back in the political spotlight for the important role he is playing to help the Trudeau government rescue NAFTA from Trump’s protectionist maws. NAFTA has generated unprecedented growth for the Canadian economy and North America. It took Canada 125 years to generate a GDP of $800 billion. Under free trade, it took only 25 years to double that. Today, the North American continent has a population of almost 500 million people and a combined GDP that tops $21 trillion. Covering less than seven per cent of the world’s population, NAFTA represents 28 per cent of the world’s total GDP. 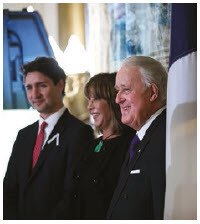 Regardless of what Canadians think of Trump and his policies, Mulroney’s advice to the Trudeau government has been to “keep our heads down, our mouths shut” and save what we should say for the negotiating table: “It’s at the bargaining table where we can make our comments, caustic or otherwise.” But perhaps Mulroney’s most important piece of advice is that “we can say no. We’re not some pushover country for someone to ambush. We’re a $2-trillion economy. We have the strength to say no.” Clearly, Trudeau is heeding that advice as he refuses to accept an agreement that contains a five-year sunset clause and no dispute-settlement mechanism as the Americans are demanding. The most enduring myth of the Mulroney era is that his relationship with two U.S. presidents was a subservient one based on weakness. It was a myth propagated by critics who were viscerally afraid of Canada getting too close to the United States. They feared Canadians could neither negotiate nor compete with the Americans. That fear was also tinged with an unhealthy dose of America envy. It’s fair to say that many of the harshest critics of free trade and Mulroney’s policies were also jealous of the more open, prosperous and competitive society that lay to the south of Canada’s borders. Needless to say, Canada did not merge with the United States under NAFTA. If anything, Canadians are now stronger, more prosperous, more competitive and more confident about themselves as a nation. The defensive, protectionist, nationalist sentiments of the 1960s and 1970s have yielded to a more self-assured, mature attitude towards our relations with the United States and the rest of the world. It is often true that some politicians who were deeply unpopular at the end of their political tenure come to be remembered much more generously with time. Mulroney, who served as prime minister from 1984 to 1993, is one such political figure. Not only was he the architect of the Canada-U.S. free-trade agreement, which morphed into NAFTA with Mexico’s accession, but his tenure was also marked by many other hallmark accomplishments. He stepped up with Canadian aid for Ethiopia during its disastrous famine in 1985. He fought to get the Commonwealth to impose sanctions against apartheid in South Africa and secure Nelson Mandela’s release from prison. He made sure Canada was one of the first Western countries to provide aid and investment to post-Communist Eastern Europe. Under him, Canada was the first to recognize an independent Ukraine. He put climate change on the global political agenda of the G7; concluded an acid rain treaty with the United States; and made Canada a full-fledged member of the Organization of American States and la Francophonie (the latter of which only came into existence with Canada’s decision to join). Many leaders are merely aspirational because they end up promising a lot more than they deliver. Mulroney delivered and got the job done. He was a trusted adviser to not one, but two, American presidents on the major global geopolitical issues of the day. In every sense of the word, he was truly transformative and left a foreign policy legacy that was not only impressive for its ambition and scope, but also one of which Canadians can be proud. Although the bureaucratic tug of war continued behind the scenes, Mulroney pushed forward. Stephen Lewis marshalled his unmatched eloquence — both in public and in private at the UN — as Canada upped the political ante in joining the world’s voices calling for an end to apartheid. A first round of Canadian sanctions levied against South Africa’s government — mild, admittedly, but some with bite all the same — were announced by [then-secretary of state for external affairs Joe] Clark at a cabinet meeting in July of 1985 in Mulroney’s hometown of Baie-Comeau. At a minimum, it is hard to argue that Canada had not changed its tone. The timing of this announcement was significant because the eighteenth prime minister was just weeks away from his maiden Commonwealth Heads of Government Meeting (CHOGM), scheduled to take place in Nassau in October. It was there, in the normally peaceful Caribbean, that Mulroney—like Diefenbaker before him in facing apartheid—faced his greatest Commonwealth obstacle on the file: the United Kingdom’s prime minister. But while Diefenbaker had to deal with the gentle patrician that was Harold Macmillan, Mulroney had Margaret Thatcher, the Iron Lady, to contend with. It is important to recall that by the time Commonwealth leaders met at Nassau in 1985, Thatcher had been prime minister for six years. Supremely self-confident and with her success in the Falklands War already a historical fact, she had little time for political “rookies” on the world summit scene, especially a young Canadian prime minister who was a neophyte. That view included her take on the new Canadian prime minister and his new Commonwealth supporters who were now calling on her to give her blessing to sanctions against South Africa. Decades later, in fact, in 2007, Thatcher revealed her views about leadership and experience to a visiting Canadian over tea at the House of Lords. “I recently met your new prime minister, Mr. Harper,” she said. “He’s awfully young and inexperienced.” “Well,” the Canadian replied, “he’s older than Mr. Mulroney was when he became prime minister.” “Yes, you have a point there,” she answered. “And Prime Minister Harper is much older than Joe Clark was when he became prime minister.” At this Thatcher laughed. “Yes,” she said grinning, “and we all know what happened to him.” In his 2015 study Margaret Thatcher, the Authorized Biography: Volume Two: Everything She Wants, British writer Charles Moore described his subject’s attitude towards Commonwealth sanctions going into the Nassau meeting. “[The meeting] toxically combined all the things she disliked with the subject of South African sanctions,” Moore wrote, “She opposed the idea of a Commonwealth contact group for South Africa and, of course, resisted economic sanctions: ‘she had heard it all before,’ she told the Canadian prime minister Brian Mulroney on the first evening at Lyford Cay when he argued for new measures. Sanctions ‘would only damage industry which was in the lead in breaking down apartheid.’ Mulroney . . . tried to win Mrs. Thatcher over by telling her how a British initiative over South Africa would make Commonwealth members ‘all stand in line and salute.’ Mrs. Thatcher was not tempted, believing, on the contrary, that the Commonwealth liked to treat Britain as a target, not a guiding star.” In a footnote, Moore offers further explanation of his subject’s attitudes and her private views of them. “One fact,” he wrote, “that may have swayed Mrs. Thatcher towards high-handedness was her irritation at the pretensions of Commonwealth leaders less experienced than she. She regarded India’s Rajiv Gandhi in particular as ‘posturing and shallow’ and believed that ‘He and Mulroney were obviously keen to cut a figure at the meeting, but did not really have the experience for their self-appointed role.’” These comments on Thatcher’s position, Moore reports, were made by her senior advisor Charles Powell. Still, the Commonwealth did not split completely, and Mulroney, joined by Rajiv Gandhi of India, Bob Hawke of Australia, and others, soldiered on. Right after the Nassau meeting, Mulroney made his debut address before the UN General Assembly in New York City. Sources confirm that in the original speech Mulroney was supposed to deliver, Department of External Affairs officials had carefully removed any reference to the use of sanctions against South Africa. 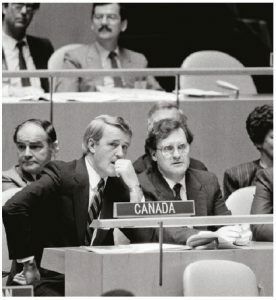 As Mulroney and Lewis sat outside the General Assembly Hall moments before he was to deliver his speech, they discussed whether Mulroney should reinsert the reference to sanctions. And, so he did. Mulroney’s speech to the Assembly was electrifying. Delegates rose to their feet. They were stunned and exhilarated. In a word, the speech transfixed not just the delegates in the General Assembly who had never heard a major Western leader speak so passionately against apartheid, but also many Canadians, even those who were still suspicious of Mulroney and his government’s true commitment to the anti-apartheid cause. “My government has said to Canadians that if there are not fundamental changes in South Africa, we are prepared to invoke total sanctions against that country and its repressive regime,” Mulroney declared. “If there is no progress in the dismantling of apartheid, our relations with South Africa may have to be severed completely. Our purpose is not to punish or to penalize, but to hasten peaceful change. We do not aim at conflict but at reconciliation — within South Africa and between South Africa and its neighbours. The way of dialogue starts with the repudiation of apartheid. It ends with the full and equal participation of all South Africans in the governing of their country. It leads towards peace. If it is not accepted, the course of sanctions will surely be further pursued. More than that, if there is no progress in the dismantling of apartheid, relations with South Africa may have to be severed absolutely.” It is doubtful that any other Canadian prime minister, up to Justin Trudeau and including Lester B. Pearson, has made such a clear and risky address to the UN and put Canada’s reputation on the line before the world. Excerpted from Master of Persuasion by Fen Osler Hampson. Copyright © 2018 by Fen Hampson. Published by Signal, an imprint of McClelland & Stewart, a division of Penguin Random House Canada Limited. Reproduced by arrangement with the Publisher. All rights reserved. Fen Osler Hampson is the director of the World Refugee Council. He is also chancellor’s professor at Carleton University and distinguished fellow and director of global security & politics at the Centre for International Governance Innovation.